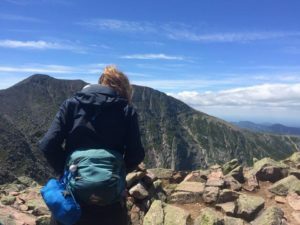 Things change a lot when you spend 5 months living in the wilderness carrying all of your stuff on your back. I’ve learnt so much about what an authentic, simple life looks like – and let me tell you, it sure does not have room for all the belongs that exist in my life. Now I never had an official “pack shakedown” but I did ditch a fair amount of things along the way. 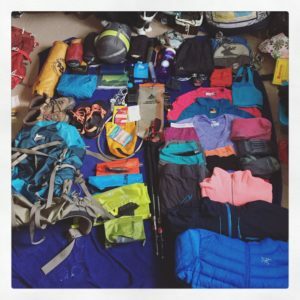 Here is link to my original gear list from when I started in Georgia. Now keep in mind I was carrying extra layers to ensure I would stay warm in the winter weather. But it was a little bit ridiculous how many things I thought I would need. Gregory Deva 60L AKA Bertha. I stuck with her to the very end. Which for anyone who spent time hiking with me is probably surprised about. Bertha squeaks 24/7 which drove me crazy enough to seriously consider throwing her off many different cliffs. But she was super comfy and had a very convenient fanny pack option for the slackpacking days. I miss being attached at the hip with her. The fanny pack in action on the Knife’s Edge. Big Agnes Fly Creek UL2. Although I tended to shelter when possible I love this tent! It had enough space for me and Bertha to fit comfortably. 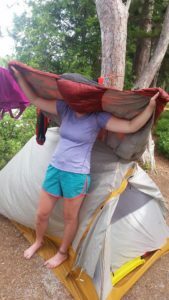 It is a small 2-person tent but I did manage to share it when a friend needed a place to stay. I swapped out my winter bag for this lighter, cooler, smaller quilt thanks to Stan who left it for me when she went back to the homeland. This was hands down my favourite piece of gear. The best part was the face hole, not only was it practical on the chilly nights but it was so fun to wear like a cape! I’m basically a child. It’s fine. Altra Olympus 1.5 Trail Runners. I wore through 3 pairs, each lasting me 600-800 miles. My feet were always happy thanks to the ample amount of foam. They were lacking on the traction side, especially on bog bridges and rocks. Can anyone give me suggestions as to certain brands to purchase for best quality? I have a pair of merril shoes that I LOVE!!! !